1. SD3-150 136 - 174 MHz. 10 MHz. 3 dBd. 2. SD6-150 136 - 174 MHz. 10 MHz. 6 dBd. 3. SD6-450 406 - 512 MHz. 25 MHz. 6 dBd. 4. SD9-450 406 - 512 MHz. 25 MHz. 9 dBd. 6. SD6-250 220-290 MHz 20 MHz 6 dBd. 7. SD9-250 220-290 MHz 20 MHz. 9 dBd. 8. SD6-400 380 - 420 MHz 40 MHz. 6 dBd. 9. SD9-400 380 - 420 MHz 40 MHz. 9 dBd. 10. SD3-75 66 - 88 MHz 6 MHz. 3 dBd. 11. SD6-75 66 - 88 MHz 6 MHz. 6 dBd. 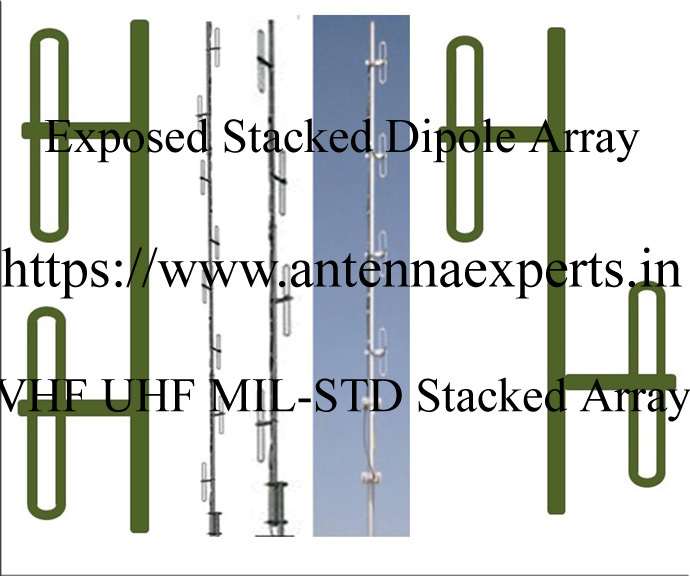 Antenna Experts manufacture omni-directional stacked dipole antenna for 30-66MHz, 75MHz (66-88MHz), 150MHz (134-174MHz), 250MHz (220-290MHz) 350MHz (320-400MHz), and 450MHz (400-512MHz) frequency bands with 3 dBd, 6dBd. 9 dBd. and 12 dBd. gain. The SD series high performance VHF/UHF exposed open stacked dipole arrays are designed for use with highly populated radio sites requiring long haul omni directional coverage. Exposed stacked dipole array are available in combination of 2 dipoles, 4 dipoles and 8 dipoles configuration. The SD series heavy duty stacked dipole array features, wide bandwidth, high gain, high power handling capacity, low VSWR, low noise performance and null filling coverage with omni directional characteristics which are highly suitable for TETRA and SCADA applications. Our SD series ultra high performance stacked dipole array are designed for use with highly populated radio sites requiring long haul omni-directional coverage. The SD series antenna are heavy duty stacked dipole array features, wide bandwidth, high gain, high power handling capacity, low VSWR, low noise performance and null filling coverage with omni-directional characteristics. These stacked dipole array maintains constant gain and VSWR over its specified bandwidth, making it highly suitable as base station antennas for repeater, paging and any other multi-channel communication systems. The radiation pattern can be changed in the field by use of common hand tools. The Vertical stacking distance of stacked dipole antenna are factory adjusted for highest possible efficiency. Specially designed center fed phasing harness of exposed dipole antennas ensures equal and in phase signal distribution to all the dipoles. All the SD series high gain exposed stacked dipole array operates at D.C. ground for protection against lightning. The stacked dipole array uses 6063T6 ultra corrosion resistant architectural anodized aluminum, consists of number of folded dipoles stacked vertically, fed in phase. The center fed dipole ends and cable connections to the dipoles are sealed in epoxy at the end of the boom for protection against weather and imparting rigidity and strength to the dipoles structure. All the fasteners are made of marine grade SS. The central mast for mounting the dipoles is shipped in two/four sections of equal length for easy of shipping. The dipoles are mounted on a tubular boom made of high strength aluminum alloy, which offers a low resistance discharge path against any lightning strike during the stormy weather. The N-Female termination of antenna sealed in flame retardant heat shrinking tube ensures complete waterproofing. The antenna can be supplied with or without central mast. Antenna Experts manufactured SD series Stacked Dipole Antenna for higher gain and higher power broadcasting applications. SD series stacked dipole array is manufactured using 6063T6 ultra corrosion resistant architectural anodized aluminum alloy. Powder coating of the complete antenna provides extra protection against corrosion in saline weather present in coastal areas. The SD series stacked dipole array is heavy duty features, wide bandwidth, high gain, high power handling capacity, low VSWR, low noise performance and null filling coverage with omni-directional characteristics. This stacked dipole array is highly suitable as base station antennas vertical polarized wave. The SD series Stacked Dipole Array consists of two/four/eight folded dipoles stacked vertically, fed in phase. These Stacked Dipole Antennas operates at D.C. ground for protection against lightning. The stacked dipole antenna is suitable to mount on the top of tower and is supplied with two marine grade stainless steel mounting brackets. When the two/four/eight dipoles are arranged 180/90 degrees apart around the central mast, an omni-directional radiation pattern results. Aligning the two/four dipoles collinearly (facing in one direction) an offset radiation pattern is obtained. The radiation pattern can be changed in the field by use of common hand tools.